The Richway Mini BioMat 7000mx is the smallest Biomat, made for portability. Richway's Biomats have become world renown for their healing abilities as they use Infrared Ray and Negative Ion therapies to detoxify and then repair the body. * The Mini Mat is an approved class II medical device with the USFDA. The Mini Mat is the only Biomat with Tourmaline. 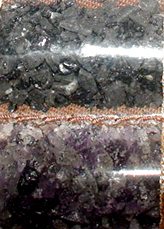 Alternating tubes of Tourmaline and Amethyst run the entire length of the Mini Mat. And because the Mini Mat is the most affordable Biomat, it is also the most popular. Order your Richway Mini Mat NOW! The Richway Mini Mat is specifically designed to be used anywhere you want to use it. The Mini Mat is lighter than any other Biomat and comes in it's own carrying case (shown left). The Mini Mat controller is smaller and customized for travel (shown right). The Mini Mat is perfect for your office chair or for sitting on the couch. Easy to move around, the Mini Mat provides you healing wherever you go. If your car has an electrical outlet, you can enjoy your Mini Mat on the road. It's the perfect size for kids, pets and to take with you anywhere. Enjoy the healing effects of amethyst and tourmaline no matter where you are! THE MINI BIOMAT HAS JUST BEEN REMODELED! The Mini Biomat is the only Biomat with both Amethyst and Tourmaline. While the Amethyst helps to produce infrared rays that warm the body, the Tourmaline produces a cooling effect. Both stones have been used for centuries to heal the human body. On the face of the Mini Mat, there is clear tubing that encases the stones, alternating between Amethyst and Tourmaline. Learn more about how Amethyst and Tourmaline work together to make you healthier. The Mini Mat also produces negative ions which raise the alkaline level in your blood, which then enables your body to rid itself of wastes better. Negative ion therapy has been documented to alleviate back pain, muscle pain, muscle spasms and arthritis. Learn more about infrared rays and ions. Most insurance companies recognize the Biomat as a valid treatment for many ailments and diseases. Biomats can be prescribed by a doctor. Call or email us for more information. Alkaline, Acidic, Purified Water from the same machine.